If there's one thing my knitting has taught me, its to give as much time to a project as possible during the 'honeymoon' stage. When you can't stop thinking about it (at work, on your commute, etc. ), that's a pretty good sign that you should work on it as much as possible. I really hate when I hit the initial 'loss of interest' stage, when project boredom comes a calling. Motivation seems to run away so easily in our fickle internet knitting world of too-many-prospective-projects and too-many-tempting-fibers. Well, I'm happy to say I'm not feeling the twinge of disinterest yet. There's only love for the SSAC around here so far, and it is flying. The color may come as a shock to you if you saw my swatch - I swatched with some stash leftovers of the same yarn in a different color (from a recently finished sweater that you haven't seen yet). I forgot to mention that in my last post. I'm a bit worried that I didn't purchase enough yarn for this one, so I'm trying to be as conservative with the good stuff as possible. The yarn, one of my all time favorites, is Classic Elite Skye Tweed in a smokey forest green with blue and red flecks sprinkled about liberally (shade #1215). I attribute my love for knitting this sweater equally to both material and design. I'm enamored with both. These photos were taken at the end of the day Sunday and there's been much more knitting done since then. As of last night, I weighed in at just over 10 inches on the body. Cross your fingers and hope that this knitting vigilance persists! It's truly lovely. Can I ask what size needles you are using? I love this kind of knitting, lots of patterning! It's going to be fabulous. The color is great. Autumn colors are my favorite and tweeds. I'll have to look for that yarn! You know, I fight with the same issue when knitting sweaters. There's certanly a puppy-love stage where the project is the center of your attention, followed by a "knitting is zen" moment, and then all of a sudden (for me) there's a ohh! Check out that gorgeous yarn! avalanche that kills progress. The good news? I've had a lot of success after coming back to an abandoned project months later! It's fresh and new again. Your sweater is looking great, btw. The great color in the tweedy bits. What a great picture--the pattern is wonderful and I LOVE that yarn! I may just have found the yarn for my Rogue--and some colors are on sale at WEBS! 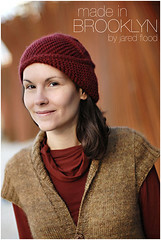 the honeymoon stage is so great for knits - especially when it lasts through the whole project! it looks wonderful. the little flecks add so much dimension along with the cables. That color is frigging awesome and your knitting ain't half bad, either! I love this sweater, and can't wait to see your finished version. I totally agree with the "honeymoon" phase of projects. 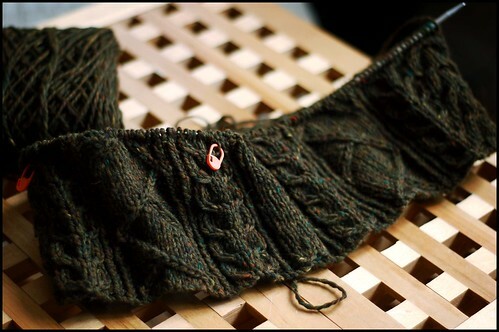 A couple of months ago I started EZ's seamless saddle shoulder sweater-I threw in a few cables and a steek for a cardigan--I have the body to the armhole and the cuff of one sleeve done, then another EZ project called to me. I'm sure I'll go back to it though and fall in love with it again. Good luck with your sweater and can't wait to see your finished pictures!! oh, that yarn is beautiful!!! 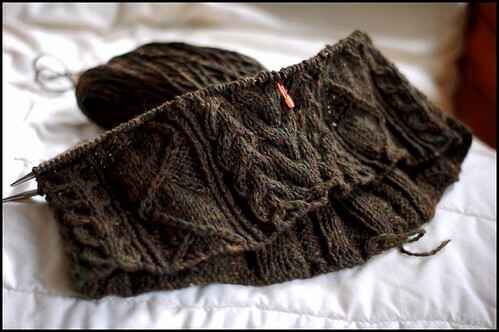 I have to say that you photos of your knitting are just stunning. SSAC is coming along beautifully. i love the variation in types of cables that are in there -- some single traveling stitches, some beefy cables, and some what-look-to-be-twisted stitches. btw, great observation about the honeymoon period. i was recently thinking the same thing myself. one of these days i'm going to finish a whole sweater while in that period. Wow, I think you knit cables faster than I knit stockinette. It's good you're still interested and trucking through! When are we gonna see the other FO? You are so right about the honeymoon period. Oh lovely green tweed cables! You make me happy. Assuming finger crossing position NOW! Looking awesome so far. Really, really nice work. That honeymoon phase is PURE TORTURE when you are faced with leaving the knitting at home! I just hit the wall on my latest project. I hope it's a LONG while before you hit yours. Great color. And when will you unveil the 'other' tobacco-coloured sweater, may we ask? well done! that looks beautiful! Your blog is one of my favorites because it is so inspiring. When I look at your pictures, I'm reminded of the beautiful possibilities knitting holds. Beautiful! 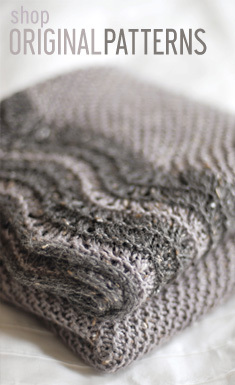 Lovely texture details and the tweediness of the yarn is really yummy. I know what you mean about running out of steam on a project - and I have the list (7 or 8 so far) of UFOs to prove it! mmmm, i love the yarn, the colors almost sparkle out of the aran design. it is such a balanced piece, not busy, your eye is flawless for the color/design match up. i wanted to say a thank you for inspiring me to do up the hybrid, my husband loves it. you can bet i will be back to see progress, keep up the sppeedy knitting. So what do you do when you don't feel the love for your knit anymore? I had a huge crush on my latest big project and worked on it like a fiend. Now I'm rather, meh. It's a lovely project, so I've decided a vacation is in order so I can fall in love with it all over. Only next time, there will be less to knit before the big finish. I am crossing my fingers even though you don't need it. It looks fantabulous. Thanks to you and the awesome sale at Webs, I now have some Skye in my stash waiting for the right project. Weeeee. This winter I just finished an XL sweater for my husband using this same yarn in the same color. It was my first sweater and I was very proud to actually finish it. The yarn was beautiful and he actually wears the sweater. Your knitting puts me to shame, however! That is going to be one truly gorgeous sweater. your sweater is going to be beautiful! the stitch definition on all those cables looks so nice and crisp. I'm so glad you like the Skye Tweed.. I've just started a sweater using that and I'm a bit apprehensive because it swatched up a bit rough (but softened on washing) so I'm encouraged that it's one of your favorite! Intriguing design, can't wait to see the finished product! Love all that cabley goodness, and the color looks great too. I hope you end up having enough yarn too. Wow, that's going to be gorgeous! Love the yarn! A yarn like that has got to help keep interest up! It's just gorgeous! that yarn (the cascade) is beautiful...lovely spots of color!